It's bold and (in my eyes) utterly beautiful! I've been wearing it pretty much all of the time with my blue jeans and DM's but today I'm channelling more 80's vibes with my green courts and a delightfully clashing bag. I'm also layered up with a denim shirt underneath, which I don't like the look of now I've seen these photos. I much prefer wearing it half tucked into my jeans with a polo neck underneath (to stop the tickles) but today I tried something different. I won't wear them together again. I'll definitely style this fluffy friend again soon (minus the shirt)... probably with more bold colour! 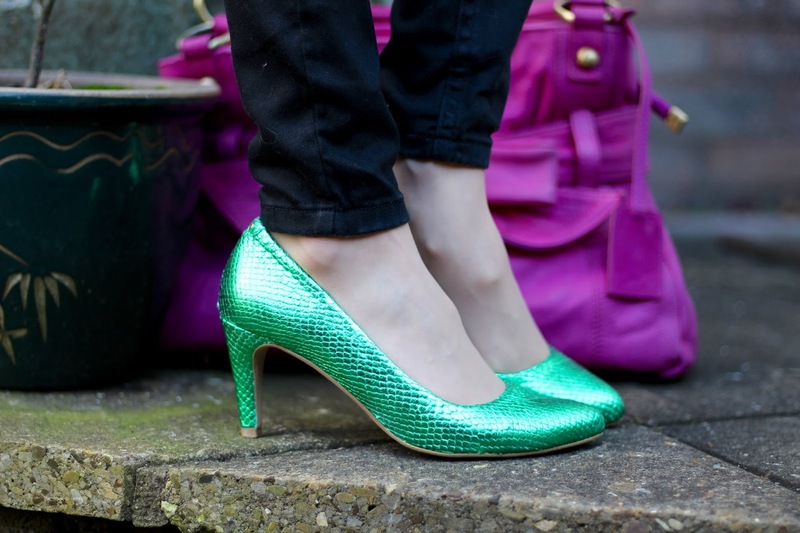 What I am pleased with is how these green metallic shoes are clashing with the jumper and bag. There is something about a bold clash that makes me feel confident and happy. Do you have any (genuine or new) vintage-style knits in your wardrobe? Dang...my mom still has some of these in her wardrobe...she'll be so happy to pull them out! I see Dolman sweaters are making a come-back as well. I have some knitting patterns around here someplace for those, will have to dig them out! I like the idea of a cropped dolman with skinny jeans. Vintage knits are snapped up so quickly where I live that I rarely get to even see them. Some 1940s delicate knits would be my idea of clothes heaven. The 1940's delicate pieces are beautiful... Unfortunately, I've never found anything pre 1950's. Huge and baggy and a delight to wear.... I'm going to have a look on ebay in a minute. I imagine yours will look amazing with leather leggings (another item I don't own). I've been seeing lots of 80s vintage knits in the trendy second-hand stores here - they are everywhere! I'm not sure about them, but I'm sure it's just a matter of getting used to them. Love those shoes! My heart, be still. Ooooo... I wish I could come for a rummage round the shops with you Sheila! Oh yeah, I can remember wearing chuncky sweaters with pumps! In winter! On the bike! Lovely look. what a fabulous color combo, I love all these clashing bold colors and the brilliant accessorizing! those shoes totally rock! Chunky sweaters are everywhere these days, but they're not usually so colorful and cool than yours. it's such a stunning piece and fits you nicely!. Rather than jumpers (I call them sweaters, but I know what you're talking about), I've been preferring sweatshirts. I can't get enough of them! I bought one this weekend for just $80HKD (that's $10USD, and when I convert British Pounds it's 7.77) from the mens' department at H&M. It's bright red--perfect for Christmas, and it says, "Fantastique!" I can't wait to wear it!! This jumper is fabulous!! And it's handmade? Even better--what a score!! And yes to those metallic pumps, and I agree about the shirt--although that is a very 90s way to wear it, remember? I'm not sure what I was thinking that day Ann?! I've always worn it tucked and had a rush of blood to the head this day! I have a bunch of my own oversized 80's sweaters that I just couldn't bear to give up! In my view, a big ol' cozy, richly colored sweater is ALWAYS a winter staple. There's always been a special corner of my heart reserved for sweaters/jumpers. You look gorgeous in these happy colors Sam! We're due a cold one this year Judy so this fuzzy friend will come in handy. I'd love a try-on of your vintage beautys! I actually quite liked the shirt underneath it. Thought it was A great way to stop the itch. I adore this sweater. So bright, so cheerful. Well spotted. I think this whole outfit is super cute. Loving that the sweater is authentic vintage and purchased secondhand. As style bloggers we have a responsibility to educate our readers about the damage overconsumption (especially within the fashion industry) is having on the planet. We cannot continue to support or promote fast fashion. Ethically the responsibility is ours. Let's make a difference.